Honest – I’m still alive. Much has been happening and much knitting (and a little bit of frogging too, let’s be honest) has been going on. My husband lost his neck warmer on his way home from work the other day so I finally had the kick in the pants excuse I needed to get one finished so I could take some decent pictures and get the actual measurements. I did make several of these for Christmas presents this year, but they were started on the morning of the day they were to be given, so pictures and measurements (pretty crucial to a pattern) were not to be had. Here it is in all it’s neck warmer glory being modeled by my friend M. It is a very quick knit and only uses about 100yds of worsted-weight yarn although your own mileage may vary. Like it, hate it, ambivelant – let me know! Thanks for looking! Since Geocities is now defunct, my patterns are being hosted at Ravelry. 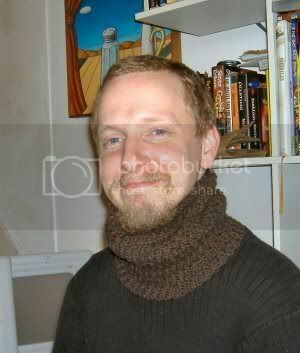 You can download the PDF directly from the Ravelry Neck Warmer pattern page. Not a member of Ravelry? You really should be. It’s an incredible resource and FREE so what’s not to love? Still not feeling the Ravelry love? Leave a comment and I’ll email a copy of the pattern to you.